Our daughter, Rebecca (Becky) O’Doherty’s fight for her health has reached a critical point. After 10 years of treatment and testing she will undergo the second part of a transplant to repair her immune system, whose dysfunction has caused significant neurological, metabolic, gastrointestinal damage. After graduating from UNC and the Robertson Scholars Program in 2005, Becky committed her full passion and energy to working with young people at Appalshop in Whitesburg, Kentucky. Just as Becky was making significant progress on issues of poverty and educational attainment, she was forced to leave the work and young people that she loves to undergo full-time medical treatment . Through ups and downs, Becky has maintained her generous and caring spirit, wry sense of humor, and drive to get well. Rebecca’s next round of treatment is costly and must be paid out of pocket. This puts Rebecca and her family up against a challenge they can not meet alone, and your help is greatly needed. While Becky has health insurance, most medical and transplant expenses are not covered. So many friends and family members have been supporting Rebecca throughout this process. You have shown great compassion and grace in these challenging years. Thank you! And now Rebecca needs a new kind of support – monetary support – to make this treatment a reality. Family and friends of Rebecca O’Doherty are raising money for Help Hope Live to fund uninsured medical expenses related to her transplant. Donations to Help Hope Live will help ease the financial burden of a transplant which will allow Rebecca to focus on a healthy recovery so that she can, once again, begin advocating for positive social change! With your support she looks forward to a bright future and resuming so much of what she is now unable to do. Rebecca returned home earlier this month from Nutech Hospital after her second transplant procedure. She is doing remarkably well and is more stable and capable each day! The best news from this round of treatment is that Rebecca’s most recent brain scan continues to show improved brain function and capacity. All of the incredible gains she has made over the last nine months remain stable and there has been no sign of regression. This indicates her disease process has been arrested and her recovery of important neurological, immune, and metabolic functions will follow. Rebecca still requires repair in her optic nerve, liver, and metabolic system. She will continue with daily physical and occupational therapy throughout the winter and return to Nutech Hospital for her LAST stem cell transplant in February. Today, National Giving Day, is a great day to join us in supporting the medical treatment of our beloved Rebecca O’Doherty with your donation. A generous donor has pledged to match each dollar we raise between the beginning of November and the end of the year, so your donation will go twice as far! Additionally, if you give today, Tuesday, November 27th, National Giving Day, Help Hope Live will generously cover the credit card fee for ALL your donations in honor of Rebecca made at helphopelive.org! Please join us in supporting Rebecca’s medical treatment by making a tax-deductible donation through Help Hope Live. As you may be aware, this treatment is costly, not covered by insurance, and every expense will be paid out-of-pocket. Any size contribution will be greatly appreciated and donations made before December 31st are tax-deductible for 2018. Thank you so much for keeping Rebecca in your thoughts and prayers – it has been a long road and we have been blessed with such extraordinary support each step of the way. Every donation (no matter the size) will be important and make a difference in Rebecca receiving critical medical care that is not covered by insurance. Our goal is for 100 individual donors to join us by the end of 2018. Please join us in sending Rebecca off with well wishes for her next and LAST transplant! This fundraising campaign in Rebecca’s honor has been established with HelpHope Live, a nonprofit organization that has been providing community based fundraising guidance to help patients and their families in need (assisting the transplant community) for over thirty years. All donations are tax-deductible to the full extent allowed by law and are held by Help Hope Live in the New York Stem Cell Transplant Fund. Donations are allocated based on financial need for medical expenses. For more information contact Amelia Kirby at [email protected] or Gail O’Doherty at [email protected] or (516) 317-2847. The Strides for Recovery Walk went beautifully earlier this summer in New York and in Virginia! Check out these photos of our caring and wonderful walkers! We want to say a huge thank you to everyone who came to join us and everyone who supported us virtually with your donations and good wishes! Rebecca’s last stem cell transplant was 6 months ago and her improvement since then has been remarkable. With the help of physical and occupational therapy she is regaining physical and cognitive function. She will return to the hospital tomorrow for her second transplant so this progress can continue. 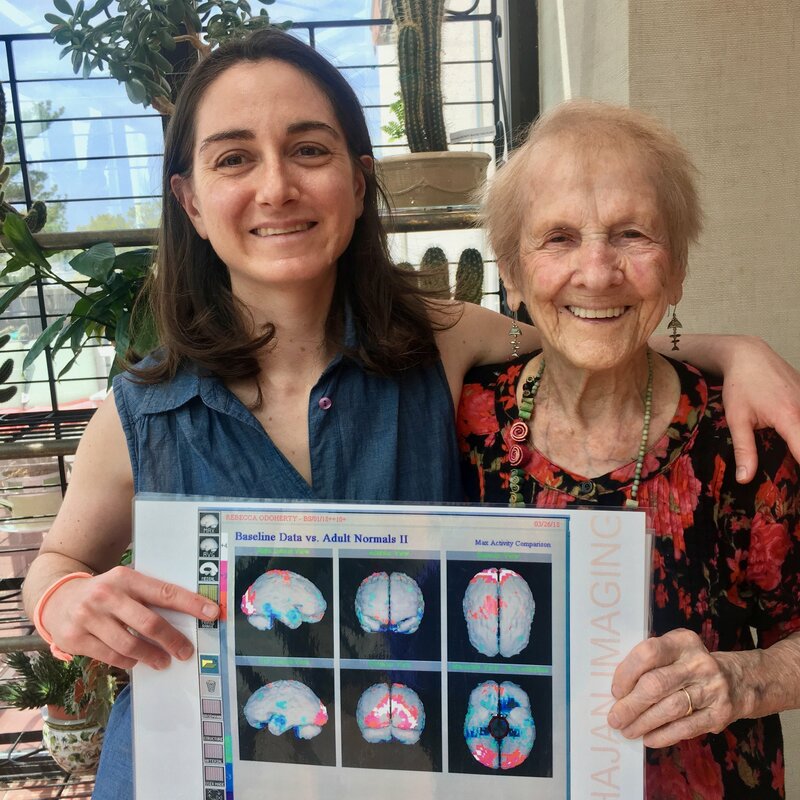 The most exciting news is that the two main biological markers in Rebecca’s labs indicating brain inflammation are normal for the first time in ten years! We wanted to let everyone know that every donation (no matter the size) will be important and make a difference in Rebecca receiving critical medical care that is not covered by insurance. 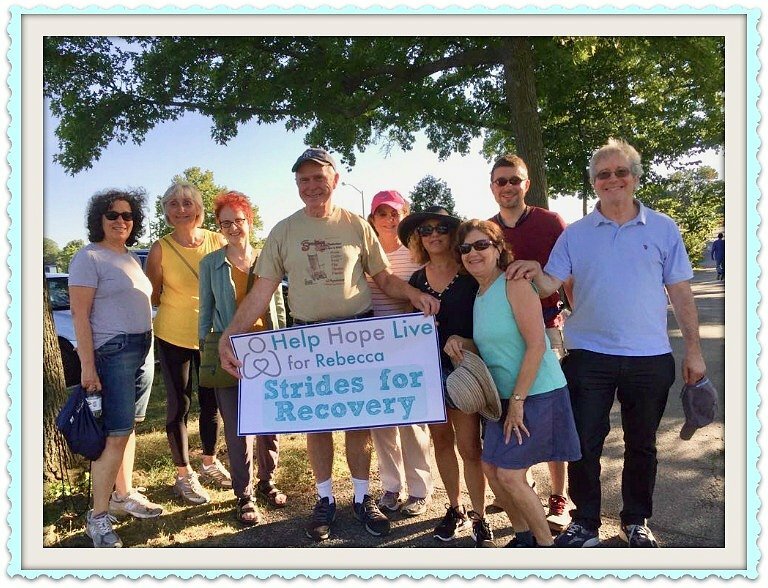 Our goal is for 100 individual donors to join us by the end of September in support of our Strides to Recovery Walk, and we’re over halfway to meeting our goal! Please join us in making this happen and sending Rebecca off with well wishes for her next transplant! The Strides for Recovery Walk went beautifully last Monday evening in New York and earlier in the month in Virginia! Check out the photos of our caring and wonderful walkers! We want to say a huge thank you to everyone who came to join us and everyone who supported us virtually with your donations and good wishes! We wanted to let everyone know that every donation (no matter the size) will be important and make a difference in Rebecca receiving critical medical care that is not covered by insurance. If you can, please join us in donating to make her next phase of medical treatment possible. On Monday, July 9th, a group of friends and family will walk to raise funds for Help Hope Live in honor of Rebecca O’ Doherty to make her medical treatment possible. All proceeds will be used for uninsured transplant-related expenses that Rebecca needs to cover before October of this year. Unable to attend, but want to join us in spirit? Please consider donating today! We are so happy to have good news to share about Rebecca’s medical condition! Since stem cell transplant in December she is seeing measurable improvements in her overall health. This is great news following the hard work Rebecca put in during her 3 ½ month hospital stay and the excellent care from the doctors and staff there during the process of her stem cell transplant. The significant positive progress is an excellent indicator for the effectiveness of the transplant and her prognosis for future and continuing recovery. Because stem cells mature gradually, Rebecca is in the midst of a slow recovery as her strength and stamina begin to rebuild after 10 years of illness. The seriousness of her condition will require a second stem cell transplant in the fall. I know all of her supporters will be cheering her on with love and encouragement during these coming months, as she struggles to heal and regain her stamina. Thank you again so very much for keeping Rebecca in your thoughts and prayers. It is a blessing to know she is so loved and cared about. Join Our Matching Donor in Helping Rebecca! On this day of gratitude and giving, we want to share the good news that after a challenging year, our beloved Rebecca O’Doherty is well enough for her next major round of treatments. A generous donor has offered to match all donations to support Rebecca’s uninsured medical care from the beginning of November to the end of the year! Additionally, if you give today, Tuesday, November 28th, National Giving Day, Help Hope Live will generously cover the credit card fee for ALL your donations made at their website. Please join us in supporting Rebecca’s medical treatment by making a tax-deductible donation through Help Hope Live. As you may be aware, this treatment is costly, not covered by insurance, and every expense will be paid out-of-pocket. Any size contribution will be greatly appreciated and any donations made before December 31st are tax-deductible for 2017. We have great news! It has been a tough year, but Rebecca has responded well enough to her last round of immunotherapy and stem cell therapy that she is ready for the most intensive phase of treatment yet. Thanks to your generous support this summer and fall Rebecca is now in the best health possible to receive the next phase of stem cell transplants that will be pivotal to her recovery. It’s wonderful during this season of thanks to reflect on the generosity, love, and support that Rebecca has received from all of you. We are so grateful that your support made her medical treatment possible, and as we approach Giving Tuesday, November 28th, we ask for your special consideration for a donation to help her get her next transplant in December. As you may be aware, this treatment is costly and not covered by insurance. Your donations will go even farther this giving season, as on Giving Tuesday, November 28th, Help Hope Live will generously cover the credit card fee for ALL your donations made to Help Hope Live in honor of Rebecca. Please consider making a tax-deductible contribution. Any size contribution will be greatly appreciated. There’s still time to enjoy tax savings in 2017 if you donate before December 31st. Please keep Rebecca in your thoughts and prayers – it has been a long road and we are so grateful so many family members and friends have rallied around Rebecca. With your generous support Rebecca will receive the next phase of treatment that she needs and can look forward to a bright future. This fundraising campaign in Rebecca’s honor has been established with Help HOPE Live, a nonprofit organization that has been assisting the transplant community for over thirty years. All donations are tax-deductible, are held by Help HOPE Live in the New York Stem Cell Transplant Fund, and are administered by Help HOPE Live for medically-related expenses. Gail O’Doherty at [email protected] or (516) 317-2847. Donations made in honor of a specific individual or in response to campaign solicitations are restricted by region only and do not obligate HelpHopeLive to allocate funds toward a specific individual, as the IRS would deem such donations to be private gifts, which are not tax deductible. Patients receive support according to their medical and financial need. Help Hope Live is a 501(c)(3) nonprofit. Information at 800-642-8399. The Walk for Wellness went beautifully last Saturday! A great group of friends and family gathered for a fun walk on a gorgeous day (check out these happy faces!). We want to say a huge thank you to everyone who came to join us and everyone who supported us virtually with your donations and good wishes! We are so thankful for your love and support, and your participation in Becky’s Help HOPE Live Walk for Wellness fundraiser. It has been incredible to see the care and commitment so many people have for Becky! With your help she will receive the medical care she needs. We’re very happy to report we’ve made progress towards our goal and 57 individuals and families have participated in the Walk for Wellness by donating to Becky’s Help HOPE Live Fund. We hope to reach our goal of 100 total participants by June 30th and you can help! One of the simplest, most effective ways to help is to share information, adding your own personal message about the campaign and why you care, with your networks through facebook or email. If you would like materials that you can personalize please get in touch and we’ll share! 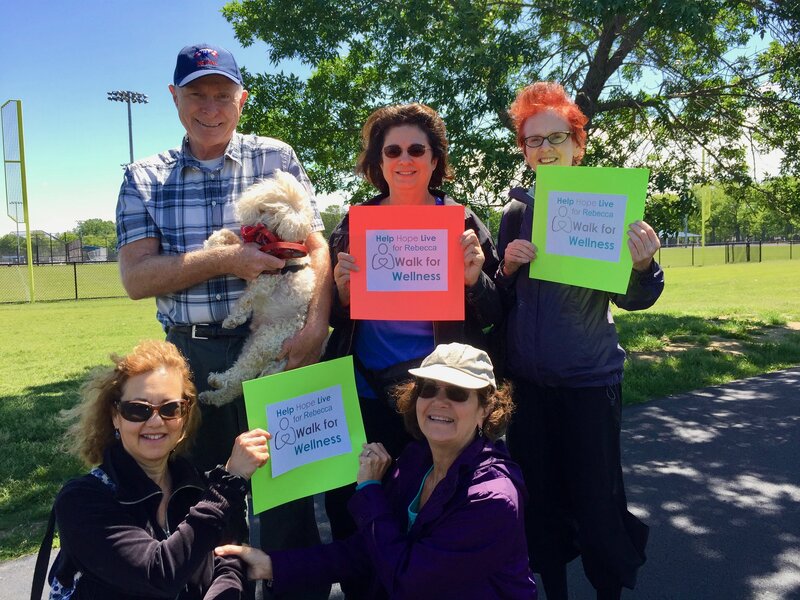 Others are organizing their own informal Walks for Wellness with a few friends and family. We’d be delighted to help you set up an easy, informal walk in your home community! Thank you all so very much for your inspiring, loving, generous support! We can’t say enough what it means to Becky and to her family to have such a powerful network of care. You’ve been an integral part of helping Rebecca O’Doherty through her arduous medical journey and we are at a new, hopeful moment in that process. The treatment you‘ve helped make possible has made a significant difference in her health and she is now preparing for a third round of stem cell treatment. This is a critical time in her treatment and folks are rallying to help her through! On Saturday, June 3rd, a group of friends and family will walk in Long Island, New York to raise funds in honor of Rebecca. We are reaching out to our communities and networks asking for donations to help us raise funds for the upcoming treatment and meet our Walk-a-thon goal. Your willingness to help raise funds for Rebecca in 2016 made a big difference and I’m hoping you may choose to join our efforts again! As we build momentum for the fundraising walk, I’m seeking both direct support for the fundraiser and also assistance in spreading the word. a) For those who know Rebecca and would be likely to donate, and those who don’t know her, but love and trust you and might be interested in donating with the right ask, an email, facebook message or phone call to ask for folks to contribute through the online fundraiser page. Similarly, you can post to your social media and ask that others share the link. Whether email or social media consider editing the attached letter for your purposes with a personal introduction at the top before sharing. An appeal from you to your circle or community usually is much more effective if you share why the effort or person is important to you. Please let us know if there is any other way you would like to be involved! Wow! We’ve reached $12,806 to support Rebecca’s medical treatment thanks to all your support and efforts! Thanks to your support we’ve reached $9,820 in donations for Rebecca’s medical fund. We have one week left to meet our goal and have all donations doubled by our matching donor! Thanks to your love and support we’ve raised $6,505 so far! Thank you so much to those who have given to the campaign or shown your support by sharing with others. Your contribution is so appreciated. We have three weeks left to meet our goal and have all donations doubled by our matching donor! In the spring of 2014 I accompanied Rebecca to the Paracelsus Clinic where she underwent some of the rigorous and intensive treatments that were fundamental to the progress she’s made. No matter how much I thought I knew about her fight, being there at the clinic with her gave me a different, powerful window into just how fiercely she is fighting and just how committed are the team of doctors—in the U.S. and abroad—who are working on her behalf. Those of you who have been able to spend time with Rebecca in person know that beyond being a tenacious fighter, and a sparkling intellect (I suspect she is rolling her eyes at me as she reads that), she is one of the kindest, most generous, most abundantly loving people one could hope to have in your life. She gives of herself without hesitation and in a fashion that makes the recipient feel both truly known and truly valued. Donations that YOU GAVE from this HelpHOPELive campaign made my medical treatment possible in 2014 and made 2015 a very important turning point in my illness. THANK YOU! Because of your support I was able to access treatment at Paracelsus Clinic and at home in the US which stabilized my condition and prevented further deterioration. I’ve been able to receive ongoing treatment to improve my neurological and cognitive function and work with an infectious disease specialist to address the immune and infectious issues that I’m facing. Next week I am starting a third round of intensive anti-infective and immune treatment here in New York and I appreciate all of your support and encouragement. I never could have imagined being so disabled for so long, but I am so, so lucky to be able to receive medical treatment and to have recovery on the horizon. while at the same time reminding me that I will require continuing, intensive treatment for at least the next year to build on my recent progress. I cannot express in words what it meant to have your support during this difficult and critical phase. Reading your messages meant so much to me, and knowing that your collective support made my treatment possible has been inspiring beyond words. It has been a big week! I just wanted to say thank you to everyone for all of their love and support. I just completed my first week of treatment at the Klinik in 2014. My doctors are thrilled with my progress since my last visit. I am literally the talk of the Klinik. I am already responding positively to treatment (almost immediately! ), which is a much quicker response than the month it took a year ago. Some of the treatment is difficult and painful, but I just feel so lucky to be so supported and loved, and be able to receive the treatment that I need to recover. I was very excited to hear about the fundraising you are doing to support Rebecca. This is an important next step in her medical treatment and it’s amazing she has people like you to support her. You get struck by Rebecca very early on that she is one of the most committed people you’ll ever meet. She has a bigger than her own life determination to get better. Because when you’re that sick, and you still keep putting one foot in front of the other, you have to have a sense of wanting to accomplish something more in life. I’m a doctor and I’ve seen a lot of different medical challenges. I think this condition is one of the most difficult illnesses to recover from. It’s very hard for other people to see it, and it doesn’t just affect patients physically, but neurologically as well. The suffering that patients are experiencing feels invisible. It’s a very rare and special person who can make it through. It’s a tribute to Rebecca that she has a following of people to go through this with her. I’m very optimistic for Rebecca’s recovery if she continues to follow this treatment plan, especially with everyone’s support. With all of your help, we are going to see the Rebecca you know and love come back. I can’t wait to see what she is going to accomplish in the next few years when her health is restored. In the beginning of this illness, five years ago, we didn’t know anything about why I was sick, why one system after another was failing, what started with fevers and neurological dysfunction quickly progressed until every part of my ability to function was significantly diminished. It was like being in complete darkness, in a free-falling vacuum, to have an unresponsive, disabling illness in this age of incredible medical innovation. I underwent almost round-the-clock treatment of IV’s, pills, and injections just to try and stabilize my condition and prevent further decline. It didn’t work to the extent needed, I got sicker, and my life got scarier and darker. It’s amazing to be in a different place now, where we know I can respond to a treatment plan and recover. This is my chance to go from being tethered to IV infusions and round-the-clock medical care, to regaining my life. Can you imagine? I’ll be able to leave the house without hours of preparation, take care of myself without a multi-person support team, and have enough strength and neurological functioning to sit up and enjoy a conversation with you, and actually understand what you are saying. I’m excited. There are not enough words to thank everyone who has been involved in my treatment and recovery. I am so lucky to have a chance to become myself again and be back out in the world with you all. Thinking of you and sending you wishes for a full recovery! So glad you're feeling better. Love hearing your progress. My thoughts, prayers and love to Becky and the family as you turn the corner and head to the carefree zone in good health. To good health! Jim and I are so happy to hear the treatment is working. We remain hopeful that you will continue to get better. I believe in you, and all the steps you continue to take each day toward your recovery. Thank you for teaching me more than anyone else how to be stronger & smarter in facing my own life challenges. I love you!! Rebecca, I am so happy that you have been feeling better since your last treatment. I hope the next one does the trick to make you completely well. Lots of love to everyone working for Becky's recovery! I am praying for Becky’s return to good health and a successful walk! Contribution made .All my love. Hope Help Live, you are doing amazing work. What could be better than saving lives? Especially one like phenomenal Rebecca O'Doherty. Rebecca, All the best to you and your family. Cecelia C.
Dear Becky, Don't know if you remember us but your mom used to tutor Craig. Our love and prayers are with you for what we know will be a successful treatment. As we say to our puppy, HEEL, sorry we mean HEAL!! Rebecca, supporting you and your family in this next phase of treatment. Wishing you continued positive results with treatment and sending healing light for total health, love & happiness in your life! Becky, you are loved. Get well! Keep up the good fight! Love you Becky! Was so great to see you, I'm sending positive, healing thoughts your way every day. Love and lots of hope for this year! Rebecca, Never give up! You are an inspiration to so many because of your persistence, positiveness, and gratitude. You will make it! We think about you regularly at Appalshop. The programs you started, and/or improved immensely, are still growing and affecting so many young people's lives. You are in my thoughts and prayers. There's always a place for you at Appalshop. Just get well, and come back to us! Sending lots of love. Judi & Steve are sending you healing light, love & hugs each day. Keep fighting for your return to good health. We believe you will conquer the health challenge given the love & support you receive from others in your community. This too shall pass! Best of luck from a fellow robbie and appalshop alum (duke 2011)! All them loves from your Kentucky friends! Dear Becky, Here is to 2016 being a year of good health for you. We are behind you all the way! Keep punching. We are rooting for you. Rebecca, I wish you all the best as you continue your journey back to good health. Sending lots of love! I am happy to contribute and look forward to you regaining your health. Rebecca, we are thinking of you and saying our prayers for your health and healing. May you continue to stay strong in spirit, with the fortitude to journey forward fighting the fight! In the spring of 2014 I accompanied Rebecca to the Paracelsus Clinic where she underwent some of the rigorous and intensive treatments that were fundamental to the progress she’s made. No matter how much I thought I knew about her fight, being there at the clinic with her gave me a different, powerful window into just how fiercely she is fighting and just how committed are the team of doctors—in the U.S. and abroad—who are working on her behalf. Those of you who have been able to spend time with Rebecca in person know that beyond being a tenacious fighter, and a sparkling intellect (I suspect she is rolling her eyes at me as she reads that), she is one of the kindest, most generous, most abundantly loving people one could hope to have in your life. She gives of herself without hesitation and in a fashion that makes the recipient feel both truly known and truly valued. I’m asking friends and folks who know and value Rebecca to help return some of that generous love she has so joyfully put into the world. Please consider making a donation to support her healing today. Sending lots of love and good wishes your way from Charm City. Lots of love always and forever! Sending thoughts of love and healing. thinking of you and all your strength and wisdom. sending so much love from east ky to you. Dear Becky, Your spirit and fortitude are amazing! Wishing you healing and strength. Hey Rebecca, I am so glad to hear that everything is working out with the treatment! I hope you know how important you are to me, and everyone else you taught. There is no other like you. So many loving prayers and gratitude for your amazing soul. I love you Rebecca!!!! I am thinking about you and hoping everything goes well. Stay strong sis and know that you are kickass and beautiful. See you soon. Rebecca darling, you know that Aunt Marcia is always thinking positive thoughts for your full recovery because I love you. Please get well soon. That's great news that you are responding so well to the treatment. Sending you lots of love and light. I'm so glad to hear that things are going well and that you're getting the care you need! Sending healing thoughts to you! Rebecca, I hope these treatments help and free you from them disease. My prayers are with you. Best of luck! Dear Becky, LIsa has kept me up-to-date on your illness and treatments. I am so very glad to hear that this latest treatment is showing good results. I admire your courage and ability to remain optimistic and hopeful over the past 5 years. Hopefully, your return to good health is just around the corner. I will continue to send good thoughts your way for a positive outcome. Hang in there! Rebecca, Your Aunt Paulette has shared some of your courageous story. Please know that you will be in my thoughts and prayers. I hope that these treatments will be successful and that you will continue on your journey to a full recovery. Your Aunt Paulette told me how proud she is of your accomplishments and looks forward to more of the same when you regain your health. She keeps me up to date on your situation while we work out together at the gym pool.Wishing you good results. Dear Becky, we're wishing you all the best, and are so hoping that this treatment will allow you to return to the wonderful work you were doing in Appalshop and in the youth media community. Rebecca, sending lots of good thoughts your way. I've always been so thankful that you introduced me to Whitesburg. Wishing you an expeditious recovery followed by some good dancing in the mountains. Dear Becky I was saddened to learn of your health challenges. Hearing about this reminded me of you, and your New York spirit, and your connection to Kentucky and so many of the things we did when we built the Robertson Program together. You are in my thoughts and prayers. Dear Becky, I'm so glad to contribute to your treatment fund. I hope that it is going well so far and you are feeling improvements in the making. Sending lots of love to you in Switzerland, and I look forward to seeing you soon. Dear Becky, Thinking of you and wishing you the very best for a successful treatment. Hope to see you again very soon! Hi Becky, I was so sad to hear about your illness. Although I haven't seen you in a long time, I have often thought with great affection and pleasure about those wonderful days when you and Celia were young. I am so happy that you are now on the road to recovery. Our thoughts and prayers are with you. Dear Becky, lots of love from us in North Carolina as you seek treatment and healing. We are thinking of you and sending vibes of continued strength. We are inspired by your energy. Dear Becky, I am sorry to hear about your health difficulties. You are in my thoughts and prayers. Wishing you much luck with this treatment. We are so glad you decided to do this and can't wait to see you reach your goal! So glad there is this opportunity to help you win this most difficult battle for health. We miss you and the cheer you bring with you so much. Looking forward to better days! I've never met you, but feel like I know your spirit through all the folks here in Whitesburg. Best wishes on this next step towards recovery!! Dearest Becky, We love you and wish you ongoing success in your journey towards good health. Jim and I have been keeping up with your health challenge through Amelia and Beth. We are so glad you are hopeful about this treatment and are delighted to contribute to your costs. Sending you love and light. Becky, we are all behind you. Stay strong and let each day lead you to feeling better and better. We love you! Rebecca, I am a friend of Pam Meade's also. I hope you find the support to continue these helpful treatments. Best wishes to you from Kentucky. It would be so difficult to have to feel this way. I hope you feel better soon and that the treatments are successful. I don't know you, but I am a friend of Pam Meade's. SO SORRY TO HEAR OF YOUR UNFORTUNATE HEALTH ISSUES, BUT SO GLAD TO KNOW THAT YOU ARE RESPONDING FAVORABLY TO THE NEW TREATMENT. WITH OUR PRAYERS, MAYBE YOU'LL BE BACK TO YOUR CHEERFUL, SWEET, YOU'LL BE BE BACK TO YOUR SWEET CHEERFUL, HEALTHY SELF AGAIN SOON. HOPE YOU'LL MOVE BACK IN THE APARTMENT OVER OUR HEADS AGAIN AND BE WORKING AT THE APPALSHOP VERY SOON. WE MISS YOU. PRAYERS AND LOVE GO WITH YOU. I meant "feeling well" of course. Should've checked before posting!